Strength, power and muscular endurance are fitness components with many things in common. They require the application of muscular force to overcome resistance while in motion; they involve muscular contraction of a specific muscle or muscle group; and they are measurable components of fitness. Muscular endurance is the ability of a muscle or muscle group to exert force to overcome a resistance many times. Often the resistance is the body itself. The measurement of muscular endurance is based on the number of repetitions performed. Muscular endurance is specific to the assessment. The protocol consists of four tests that measure all aspects of torso strength via isometric muscle endurance. • The TFT is used to assess the endurance of the anterior musculature of the core (rectus abdominis) (Brumitt, 2010). • The flexor endurance test begins with the person in a sit-up position with the back resting against a jig angled at 60 degrees from the floor. Both knees and hips are flexed 90 degrees, the arms are folded across the chest with the hands placed on the opposite shoulder, and the feet are secured. To begin, the jig is pulled back 10 cm, and the person holds the isometric posture as long as possible. Failure is determined when any part of the person’s back touches the jig. • Record how long in seconds the client is able to maintain the position. • The TET is used to assess the erector spinae and the multifidis. • The clinician stands to the side of the client’s torso to ensure correct alignment. • The back extensors are tested with the upper body cantilevered out over the end of the test bench and with the pelvis, knees, and hips secured. The upper limbs are held across the chest with the hands resting on the opposite shoulders. Failure occurs when the upper body drops below the horizontal position. • The lateral musculature tests (LMT) are used to assess the obliques, transverse abdominals and quadratus lumborum. • The following protocol is for both the le! and right lateral musculature tests: ‘The lateral musculature is tested with the person lying in the full side-bridge position (le” and right side individually). Legs are extended, and the top foot is placed in front of the lower foot for support. Clients support themselves on one elbow and on their feet while laying their hips of the floor to create a straight line from head to toe. The uninvolved arm is held across the chest with the hand placed on the opposite shoulder. Failure occurs when the person loses the straight-back posture and/or the hips return to the ground. • If the client is unable to assume the correct position, a gross weakness in the lateral core muscles is evident. • Ensure that the client remains in the correct posture for the duration of the test. Record the total time that each isometric position can be held, allowing a minimum of 5 minutes rest between each test. To assess core muscular endurance. • Begin with client lying prone on a stable, flat surface. • Instruct client to place their forearms on the floor, allowing the elbows to be directly beneath shoulder girdle. • Next, tuck the toes under to contact the floor. 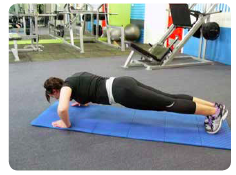 • When ready, ask the client to use their arms to push o” the ground, hovering in the ‘plank’ position. • Look for elevation of the hips or any shi!ing of position to either side. 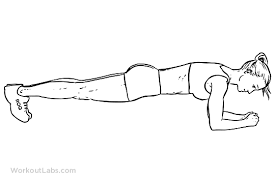 • Timed version of plank hold test: Begin stopwatch when client is in position and stationary. Stop timing at one minute, or when client can no longer hold position. • Client stands on both feet with the back to a wall, hips and knees flexed to a 90° angle. • Instruct client to lifted one foot 5 cm o” the ground and hold for as long as possible. • Timing begins when foot is li!ed and ends it when makes contact with the ground. • Record maximum time for each leg. To assess upper body muscular endurance. • Lie on the mat, hands shoulder-width apart & fully extend the arms. • Lower the body until the elbows reach 90 degrees. • Return to the starting position with the arms fully extended. • The feet are not to be held for the client. • The push up action is to be continuous with no rest. • Complete as many press-ups as possible. • Record the total number of full body press-ups. • Lie on the mat, hands shoulder width apart, bent knee position & fully extend the arms. • Lower the upper body until the elbows reach 90 degrees. • Complete as many modified press-ups as possible. • Record the total number of modified press-ups. 1. With male clients, utilize the standard ‘down’ position, using the toes as the pivotal point. The hands are shoulder width apart, the back is straight, and the head is up. With female clients, use the modified ‘knee push-up’ position, with hands shoulder width apart, back straight, legs together, lower legs in contact with the mat, ankles plantar flexed and head up. 3. Instruct both men and women that the back must be straight at all times and the pushup must be to a straight-arm position. American College of Sports Medicine (ACSM). (2006). ACSM’s guidelines for exercise testing and prescription (7th ed.). Munice, IN: Lippincott Williams & Wilkins. Blazevich A, et al., (2002). Reliability and validity of two isometric squat tests. Journal of Conditioning and Strength Research, 16(2):298-304. Brumitt, J. (2010). Core assessment and training. Australia: Human Kinetics. Durall, C. (2012). A comparison of two isometric tests of trunk flexor endurance. Journal of Conditioning & Strength Research, 26(7):1939-44. Mackenzie, B. (2005). 101 Performance Evaluation Tests. London. Jonathan Pye. Nesser, T. W., Huxel, K. C., Tincher, J. L., & Okada, T. (2008). The relationship between core stability and performance in Division I football players. The Journal of Strength and Conditioning Research, 22(6), 1750-1754.